After a whole day of walking, exploring and of course loads ofÂ shopping for the first day..
We decided to call it a quit for the day. But of course.. we need to end with a bang. After all, eating is one of the reason why, without a doubt or question.. the reason that keeps me walking. We walked passed this chaa chan tengÂ , Tsui WahÂ Restaurant ç¿ è¯é¤å»³Â which somehow seems so close to heart. It seems like I’ve been there before.. weird.. but yes. Hong Kong-style Milk Tea is definitely a must try when in Hong Kong. I mean yes, it is after all the signature drink of the country. Yes, you are only forgiven for not trying if you are caffeine-intolerant. 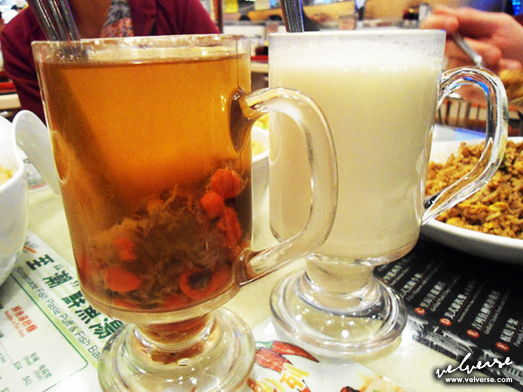 Almond Milk Tea and Eight Treasure Tea seems to also be quite a common drink served in most cha chaan teng in Hong Kong. While I personally don’t quite like the “cockroach taste-like” Almond Tea.. many seems to find it enjoyable. Well, not that it has cockroach in it… and not like I had tasted one before. Now I know what you’re thinking… I wonder how do I come up with such a taste-term. LOL! Being a pork lover, I couldn’t resist myself from ordering anything pork. This is one of the few country, finding pork-filled food is as simple as ABC. I mean, seriously… I just have to end my day right with overload of pork! What better than braised pork with dumpling noodle soup! This might not be the best in the world dish or restaurant. But I am satisfied and feel contented! Soft and tender braised pork *slurp slurp*.. pork dumpling with flavorful rich pork bone soup. Arghh… now I wish I tapau-ed some back! While we didn’t manage to try the roadside fish ball stalls, we still ordered some to try out. The different variety of fish balls in seaweed soup is really different. The seaweed definitely adds the “sea flavour” to the whole dish. As for the fish balls, they all have different texture. But I must say, the fried ones are more my style. After all, I love the crunchy skin with bouncy feeling. My cousin… oh my cousin! She of course, has a Â stronger hongkie taste in her than me. She opted for the Hong Kong-style Cheese baked Rice with Pork Chop. Which I did steal a bite or two. I mean, how could I resist… a combination of all good things in one. Yes… oozing cheese! Pork Chop! Button Mushrooms! and of course the Tomato Sauce! Damn! Sometimes I just wish I had four stomach.. and well, that I won’t get fat from just eating and eating and eating. *ooo la la*, seriously.. nothing can go wrong with XO sauce. If it ever happens, the cook should just never try to cook… ever again! I mean right, it’s a multi-purpose sauce.. created using more than 10 premium ingredients to create such a luxury sauce. A dash of the XO sauce will instantly brings the dish to stardom.. probably brings the seafood and meat back alive! *nom nom nom* braised pork and dumpling is not enough to kill the crave. I needed something more… something that has pork. Something familiar, something I grew up with.. Yes maam, that’s gotta be luncheon meat. We ordered fried rice with luncheon meat and kalian. And it was lovely! The crunchy kalian stem does give an extra texture to the dish itself. We will for sure need to walk it off a little. And everywhere I turn too, I can’t help but to see more shopping malls. And they are all calling out for me. Now isn’t this scary? 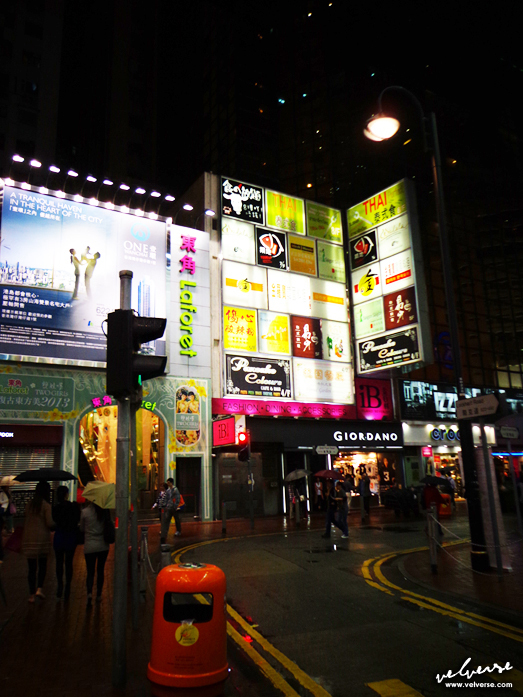 Aww.. don’t be silly, it’s just the night view of Causeway Bay.. But wait! Look what I found.. OMG OMG OMG!! 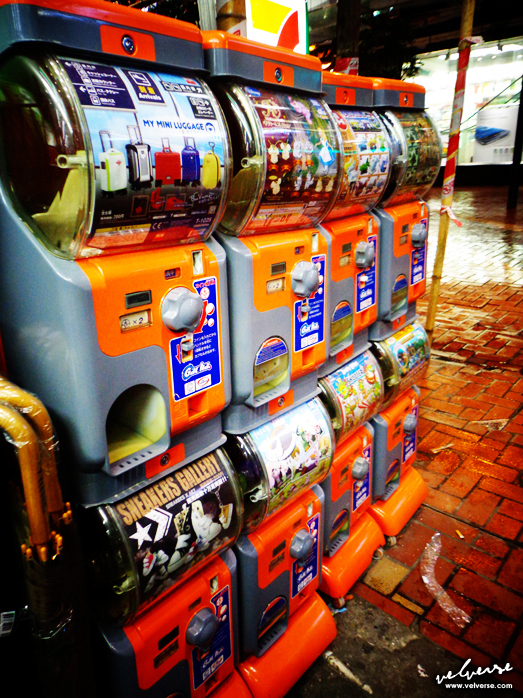 Gashapon machines. They used to be easily found everywhere and anywhere. But now, they are like relics. It has become incredibly hard to find items in Hong Kong nowadays. 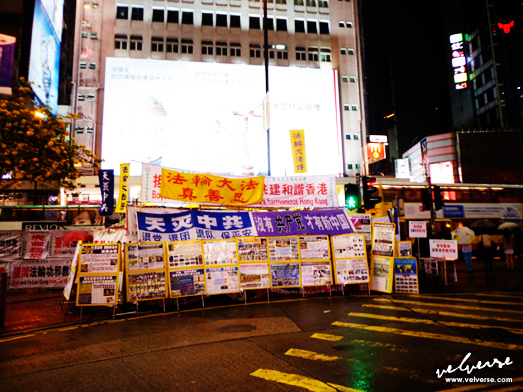 And guess what.. just before walking back to hotel… bump into some protest banners.